50-foot tri-axle design makes hauling more efficient with larger payloads. Timpte Industries, a long-time player in the manufacture of bulk commodity trailers, is expanding its American Ag Series trailer with a 50-foot tri-axle design. Available next month, the Tri-Axle model sports 15-degree front and rear slopes and contains top-of-the-line features of the legendary Super Hopper which has carried the freight for Timpte since 1980. The new trailers are designed to be light and rugged and long lasting. Smooth, aerodynamic sidewalls ensure maximum fuel efficiency with increased payload capacity. All trailers come with a three-year "Peace of Mind" warranty. More efficient trucking for dry bulk commodities is a reality with a 50 foot tri-axle trailer like this new model from Timpte Industries. 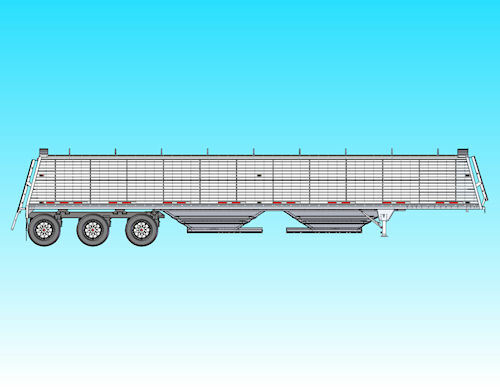 For more information on Timpte and its line of bulk commodity trailers, call (402) 367-3056, or visit www.timpte.com.